In broad terms there are really 5 factors we consider. They are 1) the route (destination); 2) the desired activities during the cruise; 3) what do you want to see during the cruise? (We consider both while on the river and while in port); 4) time available for the vacation; and 5) what company do you want to sail with on your upcoming river cruise? So, let’s explore these factors together to help you get the best possible river cruise for your next trip. Europe has the most navigable rivers of any continent. Most of Europe’s main rivers are deep enough, slow enough, and wide enough for shipping. Also, they lack waterfalls and major obstacles. The final piece of the puzzle, that helps make these rivers more navigable, is human intervention. By building canals and locks, which increases the amount of usable river area for transportation of goods and people, the river systems of Europe increased capacity. This is especially true of the Main-Danube Canal, which links the Rhine, Main (the main tributary of the Rhine) to the Danube. This unique river system has allowed river cruisers to go from the Baltic Ocean to the Black Sea across the heart of Europe on voyages of 21 days or more. I tend to group routes by river systems and so do most river cruise companies. In some form or another, they usually divide the most navigable rivers into segments that comprise a week-long trip. The Danube and Rhine and their tributaries are the two most important river system routes (as explained above) and are easily divided into 5 routes. Then, there are the 3 river routes in France, all week-long trips. Portugal’s Douro is a more isolated river system and is also a 7 day trip. Last but not least is the Volga in European Russia (Europe’s longest river at 2,294 miles, 500 miles longer than the Danube), which runs 13 days for most river cruise companies. If you are a real student of Europe River Cruising, you may have noticed I did not include two river systems—the Elbe and the Po. I have a difficult time recommending these cruises—the Elbe is a very shallow river and cruises often become glorified bus tours, as the low water levels restrict the ability to safely sail these rivers. Only 2 river cruise companies at present sail the Elbe. They are Viking and CroisiEurope. If you really want to sail the Elbe, you might consider the paddlewheel ships of CroisiEurope, but be prepared for a cruise where the primary on-board language is French. The Po is a glorified bus tour, in my opinion, as only 100 miles or so of the cruise is sailing on the Po; the rest is bus tours to the sights. Navigation is the problem on the Po; it is a very swift-flowing river and has obstacles such as constantly shifting river banks. Uniworld and CroisiEurope sail this route. As you can see, all these river systems have the advantages and disadvantages. We are the route experts—we can decipher which route might be best for your trip. The activities you prefer to participate in during your cruise help us decide what cruise line and route to recommend for your trip. We have 14 activities we ask about during our interview process. Here are just a sample: Are you active or a shopper? Are wine and food important? Do you like historical sites & museums? Maybe a festival? Your desired activities will help us determine if a themed cruise is the best option or if a particular cruise line has the activities you desire to participate in during your vacation. What You Want to see and Why do You Want to see it? This area of our questions, helps us narrow down the route for your upcoming trip. We ask what you would like to: 1) see a lot of castles, and small villages; 2) concentrate on one country; 3) see several countries; 4) sail in France; 5) sail in Portugal; and 6) visit a mix of European capitals and small villages. 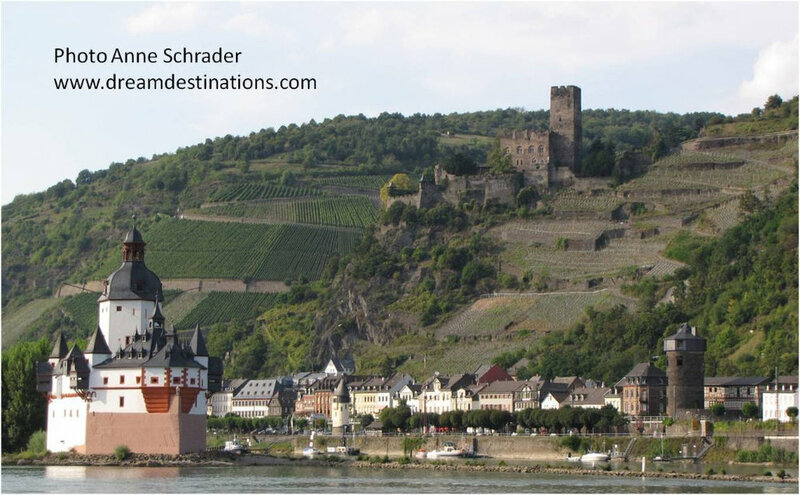 Castles on the Rhine River Gorge—maybe this is what you desire to see on your river cruise! Once we know what you want to see, we ask why you want to see these places. The why is important because it lets us know the quality of the desired experiences which make a huge difference in the outcome of your vacation satisfaction. How much time do you have for Your vacation? A Europe river cruise requires at least a 9 day vacation—2 days for flights and a 7 day cruise. Those with 16 days can combine routes into a wonderful experience—sailing the entire length of the Danube or start at the Netherlands and sail all the way to Hungary. Or you could sail two rivers in France—another great vacation. Those with 3 weeks or more can sail most of the Rhine, Main and the entire Danube. Maybe a pre-/post stay in Budapest—we have helped many visit this wonderful city! What Company do You Want to Sail with? Making the right decision for the best river cruise trip is not an easy process. Each trip is different and there are many decision points and knowledge required to make the right choices. Better information + understanding the nuances of each company = a great travel experience. This is what we strive for on each river cruise trip we plan. There will always be those who want to do it themselves, but why would you? We study river cruising in Europe almost daily, and it is hard for us to keep up—how could you possibly know all we know? We truly are Europe River Cruise Experts! As you can see, making wise travel choices, is more complex than you may have thought. Good trip planning is not easy. Making sound decisions are critical to the travel planning process. Time and money issues are complex—we all want the best at the least possible price. We help you solve those complex issues, saving you hassles, time and worry. We are travel experts, ocean and river cruise experts, and Europe destination experts. We have first-hand knowledge of almost anywhere you want to visit in Europe. We know our products and the vendors who sell them to you. We have designed special tours for dozens of clients, led several and will continue to find just the right vacation that will exceed your expectations.